Online learning provides many benefits to both learners and providers. Learners don’t have to be physically present at a specific location to receive and participate in the coursework. Typically, they can also learn on their own time, and are not rushed by a set time-structure. For providers, online courses allow the ability to scale the audience for the courses. There are different types of online learning platforms available today, and online learning is growing in popularity. Broadly, there are three different types of popular online platforms. First are massive open online courses (MOOCs) that provide free courses to anybody without the need to sign up, like the Open Yale courses. Second are courses that are free, but require learners to sign up for the platform. An example of this is Udacity. You can create your own online learning platform using WordPress to teach something in which you have expertise. Online learning using WordPress: Why create online courses? Online platforms can be a great way to scale your teachings and create passive income. People who teach one-on-one or to a small group can get limited by the time they can allot towards teaching. When you set up an online course, you can put more time into building new course material and marketing, than towards teaching the same course. This can also create a passive stream of income as learners can join the course whenever they want, and you generally don’t have to put extra effort to up-keep the course. If you have tried to learn something and have found it difficult to get good resources or instructions, chances are you are not alone. There may be others who may struggle with learning the specific area that is your forte. You can create an online course to help people accomplish and learn the topic and get results. This creates value for learners as they have a single place to go for this topic. Whether you charge for your courses or not, setting up a course can help build your brand as you establish yourself an expert in the topic. Now let’s look at how you can set up an online learning platform on a WordPress site. You can use the WooThemes Sensei plugin to create coursework and course structure on a WordPress site. This includes courses, lessons, quizzes, and more. Once you install the plugin, it automatically creates two pages – “Courses” and “My Courses”. The Courses page lists all available courses that you’ve created. The My Courses page lists all the courses a learner is currently enrolled in or has completed. For those familiar with WooCommerce, think of these as similar to the “Shop” and “My Account” pages. You can then create lessons by filling out similar details – creating written content for each lesson and adding a video, if needed. You can then assign this lesson to a specific course and set where it fits within the course. If you are charging for lessons, you can also set certain lessons as free previews so that users can get an idea of the type of content and format used in the course. This helps overcome barriers or objections people may have from purchasing lessons on a new course or platform. Lastly, you can add quizzes to each lesson and set up a structure for grades. This can help learners keep track of their understanding of key concepts from the lesson. You can also provide course completion certificates with a grade at the end. You can also add existing questions from the question bank for commonly used questions. 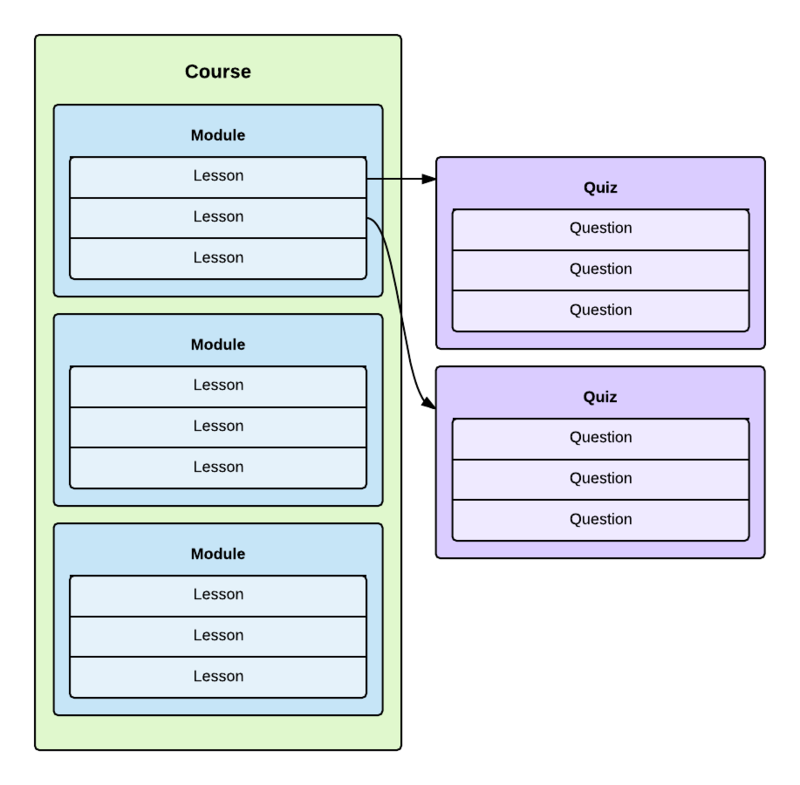 Learn more about quizzes and the different types of questions you can add in through the Sensei quiz documentation. You can start using the plugin for a single site for $129, which includes one year’s access to updates and support. Take a look at the Vitruvian Studio courses that are built with Sensei, or the Sensei live demo to see how the plugin works. There are a number of extensions you can use to add functionality to Sensei. These include timed-content drip within a course rather than all lessons being available at once, display other learners enrolled in courses, and automatic course completion certificates. You can integrate Sensei with WooCommerce to charge learners for course enrolment. You can also use the WooCommerce Memberships to enable a tiered user base where certain members can get access to specific courses, receive discounts on courses, receive discounts on ancillary products or areas, and more. Courses that you create may not all be equal in terms of difficulty for learners, and effort required for you to create them. You can set certain courses as free, and create tiered membership based on pricing for other high-value courses. You can also assign higher access and discounts to your most loyal learners. This can help build a stronger and more loyal community around your courses. Learn more about building a community using the WooCommerce Memberships extension. Online courses have been increasingly growing in popularity over the last few years. Although early online learning providers were startups and universities, courses taught by individuals for specific topics are also growing in number. Many individuals have shifted from providing tutorials on video services like YouTube, to setting up an online learning environment on their website. These courses can be open and free for all, or based on a paid membership. Instead of spending time on tutorials one-on-one with customers, you can set up a paid online course to generate passive income. This also helps your courses to scale as you can free up time to put towards marketing efforts, and building new course materials. You can use the WooThemes Sensei plugin to set up an online learning platform in which you can build and modify courses, lessons, quizzes, and more. You can pair Sensei with the WooCommerce Memberships extension to restrict courses to paid members. In addition, you can use other plugins to add functionality to your courses. For example, you can set up peer-to-peer forums using plugins like BuddyPress. Think of the things you are really good at. These can be anything like car maintenance, Microsoft Office products, gardening, programming, and so on. Now think of what you can teach that can help you generate some passive income, and that would create value for your learners. If there was one course you could set up today, what would it be? Tell us in the comments below.